With the discoveries of 132 confirmed planets and 3216 planet candidates, the Kepler mission is revolutionizing our understanding of exoplanets. Much of the focus surrounding these discoveries has centered on identifying an Earth-sized planet in the habitable zone of its host star. Now for the first time, Kipping et al., as part of the Hunt for Exomoons with Kepler project, have searched for a moon around a confirmed planet known to be orbiting in its star’s habitable zone. 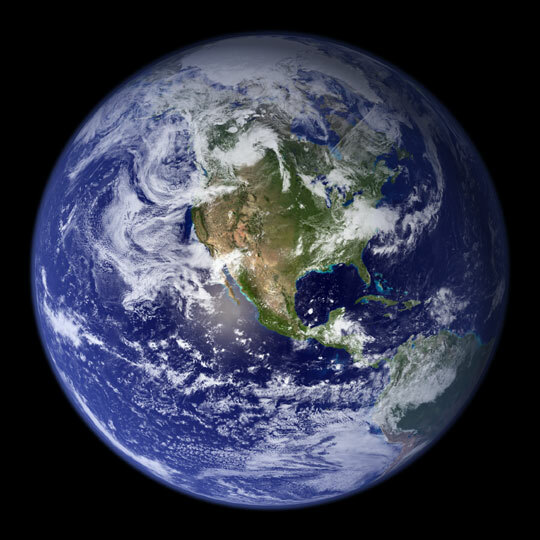 The planet, known as Kepler-22b, was the first transiting planet to be detected in the habitable zone, but with a radius 2.4 times that of Earth, it is too large to be considered an “Earth-like” planet. Nevertheless, if it were to have an Earth-sized moon, the planetary system could still contain a habitable, Earth-like world. 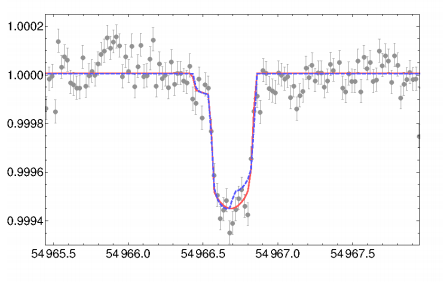 A simulated light curve for a “Kepler-22b – like” planet with an Earth-sized moon. The blue dashed line shows the “truth”, while the red line shows the recovered, best-fit model (part of Fig. 7 of Kipping et al. 2013). To identify an exomoon, the authors model the dips and features of the star’s light curve (stellar brightness vs. time), which are caused by transits of the planet (and any moons) in front of the star. This is an extremely difficult problem, as a wide range of models of planet-moon dynamics must be considered. Each of these models has parameters describing physical properties of the planet or moon (i.e., mass, radius, etc.) and parameters describing the orbital system (i.e., inclination, eccentricity, etc.). An earlier paper by these authors outlining their detection techniques was summarized in this astrobite. In short, the authors use Bayesian statistics to account for the fact that the correct orbital model for the planetary system is unknown, which enables them to determine if a model with or without a moon fits the observed light curve best. Before applying their Bayesian analysis to the observed data, the authors consider two important questions. First, would it even be possible to detect an Earth-sized moon around Kepler-22b, given the current quality of the Kepler data? To answer this question the authors generate a set of simulated light curves for a planetary system with and without an Earth-sized moon. To match the observed data, the simulated planet has the same properties as Kepler-22b, and the noise in the light curves mirrors that of the Kepler data. The authors perform their modeling analysis on this synthetic data and are able to recover the correct answer with extremely high confidence. An example of a simulated light curve for a planet + moon system is shown in the figure above. Given the noise in the simulated data, the recovered model, shown in red, is an excellent match to the “true” light curve, shown in blue. The recovered classification of the climate of a simulated Earth-sized exomoon around a “Kepler-22b – like” planet. The planet is identified correctly as habitable a significant fraction of the time (Figure 8 of Kipping et al. 2013). The authors also consider whether it would be possible to determine with certainty if a detected moon could host liquid water. They take advantage of the Bayesian nature of their analysis; it not only provides them with a best-fit to the simulated planet plus moon light curves but also tells them the likelihood that each model is the correct model. Using these model probabilities and a simulated climate for each model, the authors can determine how likely it is that the moon is habitable. 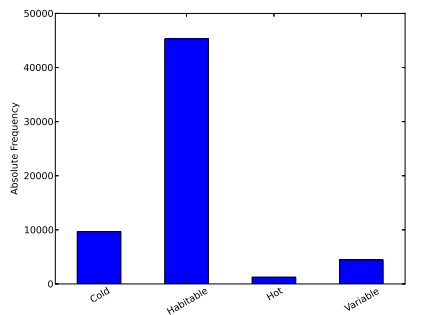 In their analysis, the “input” climate for the moon is habitable, which is identified correctly with high probability, as shown in the figure to the right. However, there still remains a roughly one in six failure rate. With these promising results in hand, the authors turned to the actual data to determine if Kepler-22b has a moon. Unfortunately, their analysis shows no evidence of an exomoon. This non-detection implies that the mass of any companion around Kepler-22b must be less than 0.54 times the mass of the Earth, with a confidence level of 95%. Thus, it is highly unlikely that Kepler-22b has an Earth-like moon. Despite this non-detection, there is still reason to be hopeful. To date, the Hunt for Exomoons with Kepler project has examined nine planetary systems for exomoons (all non-detections). With the authors’ new results about the detectability of Earth-sized moons and the remaining wealth of Kepler data to search through, large and possibly even habitable exomoons may start being found sooner rather than later.